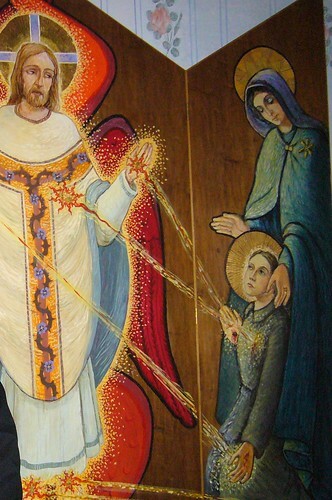 Yesterday was the Feast of Saint Gemma Galgani (- well, this year, it was also the Seventh Sunday of Easter, which takes precedence, and in some weird places it was actually the Feast of the Ascension). Saint Gemma, whom Pierre Jovanovic calls the Marilyn Monroe of the saints, is someone whose heart was not just filled with but mystically pierced by the love of God. This is vividly portrayed in the picture of the Stigmatisation of Saint Gemma in the Galgani family house in Lucca (shown above). For many years the heart of Saint Gemma was kept in a silver reliquary at Saints John and Paul in Rome but in 1985 the relic was moved to the Shrine of Saint Gemma in Madrid, Spain. Next year, when thousands of young people from all over the world come to Madrid for the World Youth Day, they will be able to learn about the extraordinary life of this young saint who lived her Passionist vocation as a layperson, not (as she had intended) as a religious. Was the heart of Gemma saddened when the Passionist Nuns of Tarquinia did not accept her into their community? Now her body lies in the church of a monastery of Passionist Nuns founded at Lucca after her death (a monastery which claims Gemma as its co-foundress), the house where she lived with the Giannini family is now a convent of the Sisters of Saint Gemma (founded by Venerable Eufemia Gemma Giannini), and her heart rests in the church of her Passionist brothers in Madrid, where devotion to her is as great as (if not greater than) in Italy.